This article was initially published by solluxcaptor at MyFigureCollection. 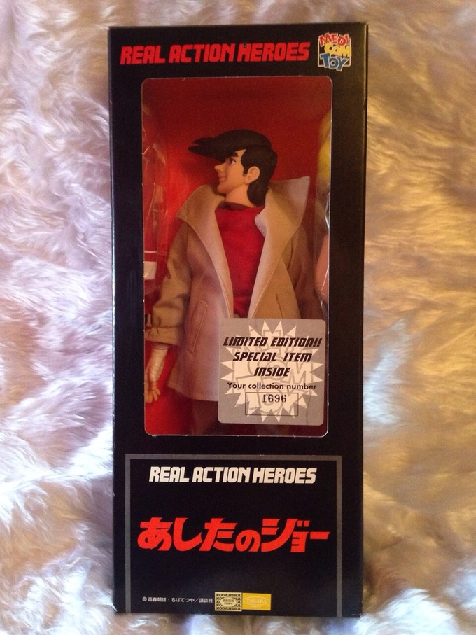 As somewhat of a enthusiast of the Medicom Real Action Heroes line, I managed to get my hands on one of their older pieces and one of my favourite characters at that!! This won't be much of a review so I'm just going to call it a loot post/showcase. I went through a proxy to buy this and got a real deal on it (3.6k yen!) so thank you to everyone who gave me their reviews and advice when I asked about proxies a few months ago. The character I'll be showcasing here is Joe Yabuki from Ashita no Joe, a series highly underrated in the West but a personal favourite of mine that moved me greatly and will probably continue to inspire me for the rest of my life. Please do check it out if you aren't familiar, it is an absolute masterpiece and it has a very influential position in anime history so you are likely to have encountered references/influences of it many times without even realising! This RAH is #35 in their line, and they have made many MANY more since, currently at #762. 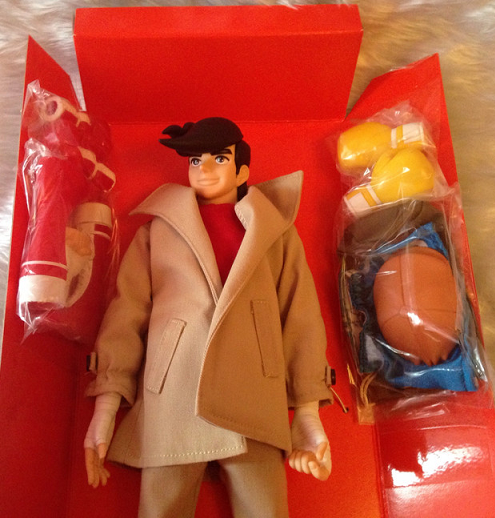 It came out in 1997, from what I can gather it was the first scaled figure of Joe Yabuki. First off I'll show the box! This is VERY basic compared to what they make today, but it is classy looking in its own way. The more recent boxes feature a 'window' and a door that opens with magnets, so they really levelled up their game but I like this more simple looking box too. Other things to note in this picture is that I got the version with the limited edition item inside and the most obvious flaw of Medicom's earlier RAH is very obviously apparent in this picture, which is the gap between the neck and the body. More recent RAH have a seamless transition from body/neck/head as the head is connected to a full body with a neck, while their earlier approach was obviously to have the neck/head be one entire separate piece to the rest of the body that looks kind of jarring when you have it tilted at a certain angle, luckily this can be 'covered up' to look natural with some careful positioning which you'll see in my later images. Sorry that I didn't take the ones on the left out but they are the shoes for his boxing attire (yep, this RAH includes a whole other outfit! They don't seem to do that anymore), red boxing gloves and a clenched fist hand. 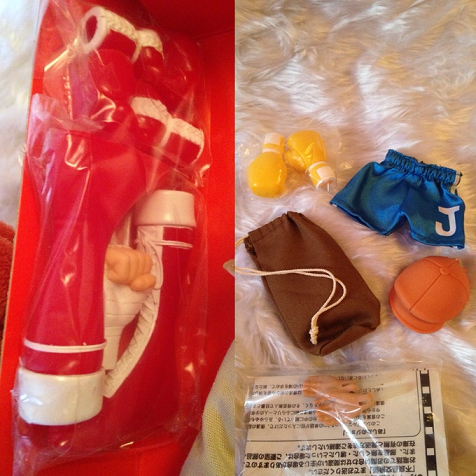 On the right are the limited edition extra item yellow boxing gloves, reaaally nicely done shorts, his bag and hat. The hat is made out of a kind of rubber/silicone material so it fits nicely onto his head and isn't awkward looking like a rigid plastic piece would be! There are also some jointed, plain hands included with the manual. His wrapped up hands don't have joints on them and just slot on over his wrists but I think they look nicer, I like that they give you the choice though. Overall I think they were very generous with the accessories!! I'm amazed that they give you the option for a whole other outfit, even though sadly the older bodies aren't the most convincing or aesthetically pleasing to look at so I probably will never change him into the boxing outfit that shows almost all of his body. They've really come a long way with their RAH bodies since then, though it went through many stages to get to where we are today. And some photos of him out of the box, in his regular attire complete with hat and bag! I REALLY love the way that they sculpted his face, it looks spot on! Same for his signature large bangs hairstyle, and the clothes themselves are very well made too. I'm really impressed with him and think he is beautiful! *__* <3 The body is very well articulated despite the age and he's definitely become one of my favourite figures in my entire collection. Another thing to note is that unlike modern RAH, he doesn't come with a stand, but you can still get him to stand up if you take a bit of time to balance it. Featuring: UFS Senou Asuka Nurse Ver., Reset-chan Nurse Dress Ver., Orochi Nurse Fuku Ver., Itazura Candy Designer Dress Kawaii Kangofu-san, Tezuka Osamu Series Black Jack & Pinoko Doctor Version, Sailor Byeong-won. Featuring: Marionetas Heidi, Sha Gojo, Nello, Tetsuwan Atom, Maboroshi Tantei, Uran-chan. The Golden Week (ゴールデンウィーク) is a collection of four national holidays: Showa Day (Showa no hi), Constitution Day (Kenpo kinenbi), Greenery Day (Midori no hi) and Children's Day (Kodomo no hi). Featuring: Free Pose Selection Kusakabe Maron, Cure Peace, Musical Reanne Griffith, Mew Pudding, Momoe Nagisa, Le Ragazze Sailor Moon Giganti Sailor Venus.